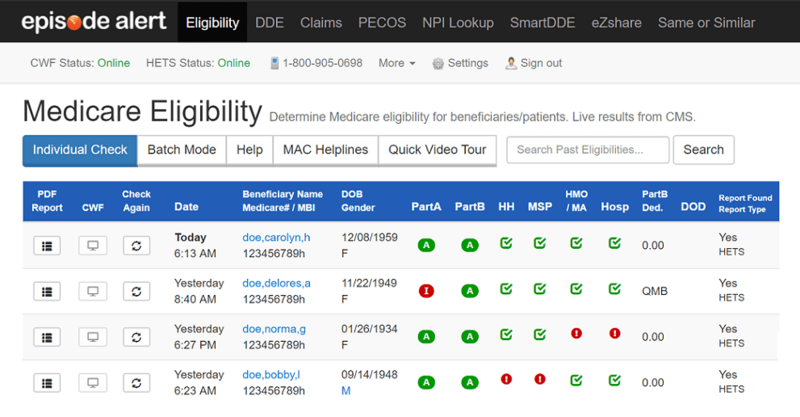 Episode Alert is leading the way in innovation when it comes to filling Medicare claims. We strive to make the process as easy as possible for EDI claim submission. When you are submitting your medicare provider claims though us, all you need to is simply click the send claims button, which will bring to our upload claim file promptly. Simply upload the claim file that you have created and you're done. 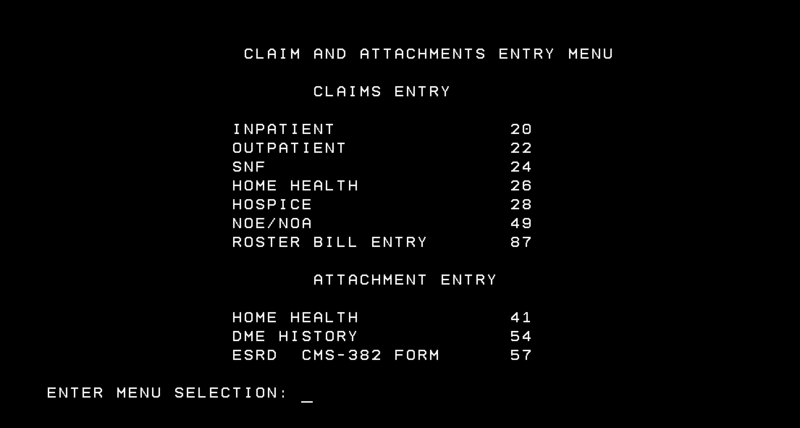 After that, you will be brought back to episode alert's Medicare claims page. Here you can see all the claim files you have sent, and all the reports you have received including remits. I'm sure you have a few questions about what Episode Alert can do for you when it comes to your electronic claim submissions for Medicare. Let's start off with showing you the process of how you will be sending your claims with us, showing you how simple it can be. But before that, you will need to have your Submitter Id and password. Which will be provided to you by you MAC (Medical Administrative Contractor). If your not sure which MAC is the right one, Don't worry we have you covered. Just follow this link:MAC Providers. There you will find all the information about which MAC is yours. Ok now that we have all of that out of the way, we can dive into things. Here you will see an image of our Medicare claim summary report page. 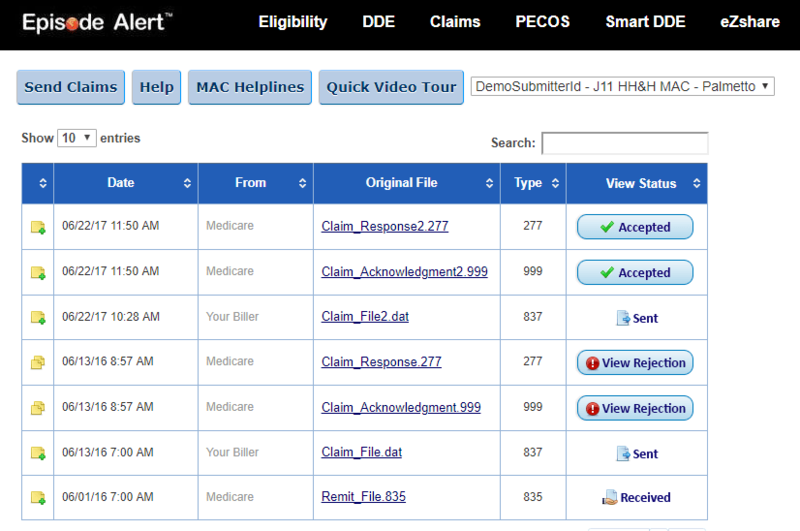 The top right button is where you would choose to view the send claims page. I will explain the details of this page in a little while. For now, let's focus on getting you familiar with our claim summary report page. Next, to the send claims button, we have options for our help section, there you can find some answers to our more frequent questions regarding claims submission. Next, we provide you with our section containing all of the Medical Administrative Contractors (MAC) phone numbers for quick access when you need to understand your claims error codes. The final button you will see is going to send you over to a quick video pop up. Here you will be able to check out some quick information about our Medicare claims services. We really recommend you take a look at them. There is a lot of great information there for you. Now just to the right of the buttons, you can see your submitter ID and if you are a company that requires submitting claims with multiple submitter ID's. Well, all you need to do is click the drop down and choose the submitter ID you need. It is as easy as that. Ok, so from here it is pretty straightforward. We have columns for name, from, original file, type, and view status. All the great information you need right there. In the top right, we have a search function to make it a little easier on you when trying to track down a certain Medicare claim file. As you may notice from the above image, we strive on making things as simple and fast as possible for all our clients when sending Medicare claims. Simply click on the choose claim file, and choose your claim file. You may have noticed the checkbox underneath your claim file. Well, this one of those nice little features Episode Alert provides. 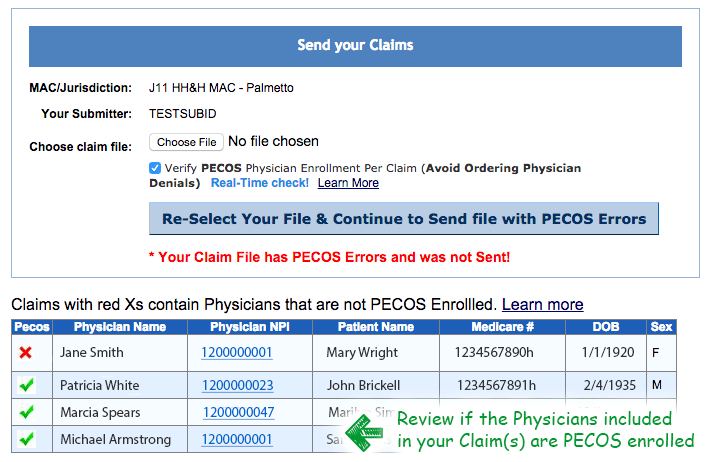 So when your send Medicare claims to CMS they want to know if your Physicians are PECOS enrolled. Otherwise, you run the risk of having your claims denied and no one likes having to deal with claim denials. So what we do is automatically check for you. Saving you the time and energy. Plus we will get the correct spelling of the physician's name. Because we all have been in that spot where we just don't know the correct way to spell someone's name. Here is where you will be seeing your claim responses. The above image shows you where a Medicare claim received their 999 acknowledgment and their 277 claim acknowledgment files. The first shows both were accepted and all you need to do is wait for your 835 Medicare remit file. 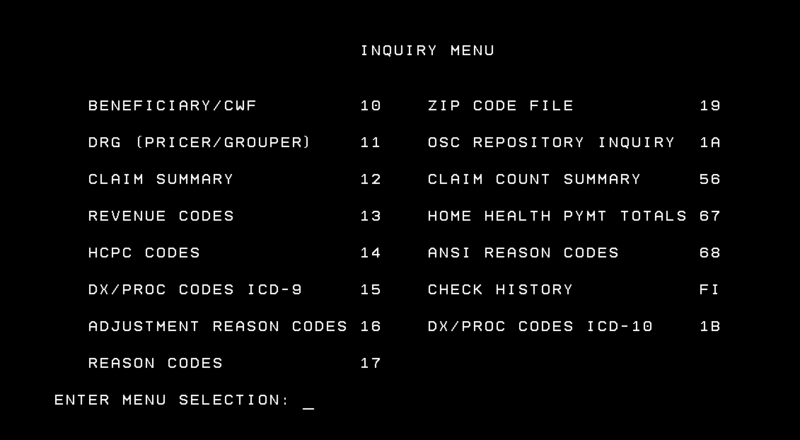 Now towards the bottom of the page, you can see that 999 or 277 file rejection. This means there was something wrong with the format (999) or something was typed wrong usually a name or address (277) of your claim file. So you will need to either go and put the files into your software and translate them. Or the better option would be to allow us to translate them for you with our Claim Alert service. Either way, once you have the error codes simply call your MAC and they will provide you with the answers so you can re-upload your claim file and move towards getting paid. 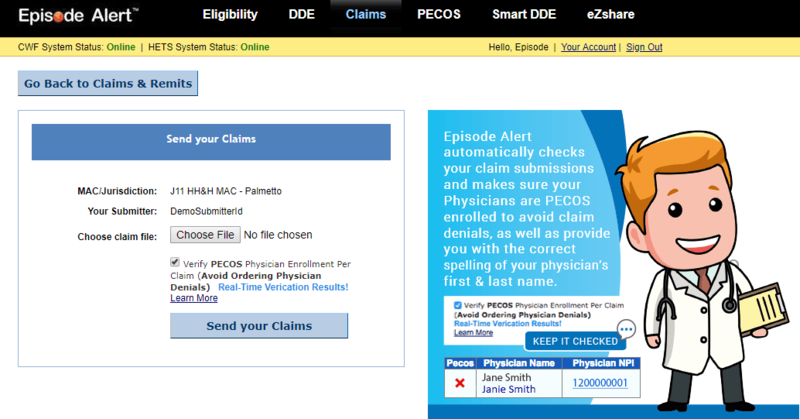 Yes, Episode Alert is approved to submit claims for all MACs (Palmetto, NGS, CGS, First Coast, Noridian, Novitas, etc.) in all 50 states. It takes 1-2 business days to setup. After that you'll start receiving your remits & reports and will be able to submit claims. 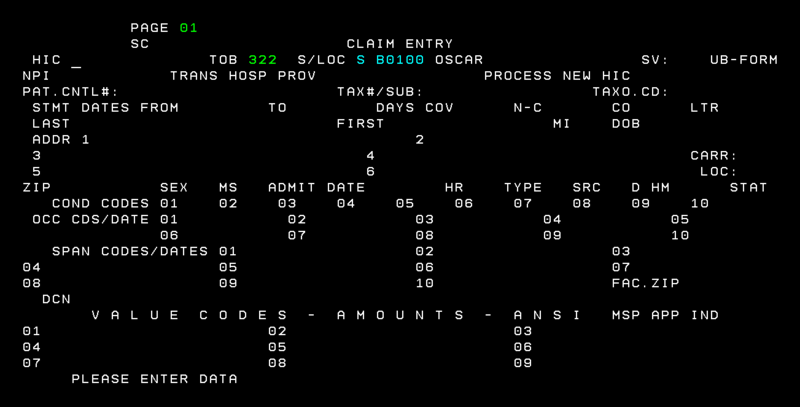 Yes, you can use any billing software to create your claim files, including PCACE Pro32. Then just upload us to our website.